A lot of people probably know Dina Burdakova as she has been playing Go for a long time, I remember her since she has been an elementary school girl. 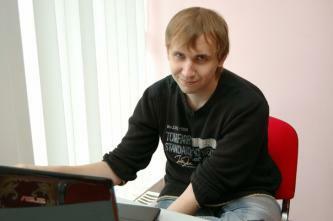 What about you, Igor, - how did you get acquainted with Go? Yes, these moments are very happy memories for Dina. She travelled a lot around the world then and befriended many interesting people. At one time she maintained contact with American-Chinese player Gina Shee. My acquaintance with the game was rather boring - I watched "Hikaru no Go"6 years ago. I decided to play against a bot. I lost and felt a kind of sportive anger. I set a goal to win it (it had 7-8 kyu level of strength) and fulfilled it in 2 months, then I decided to play against humans. We know about your love for the KGS server, so we can assume that you've got acquainted with Dina right there? Yes. Our first acquaintance happened right there. The first meeting in reality happened at the Russian Female Championship - I decided to come there and scold her for such a bad fuseki position against Natalia Kovaleva. She was shocked - a stranger approaches her and starts grumbling. tatsuha: I don't think Lee Changho plays a lot with his wife. KaaXeM: she is a wife though. She creates him comfort. tatsuha: Go player's dream is the same as every man's: you come home after some LG Cup and there is fresh borsch and your wife in apron says: "Honey, dinner is ready ^_^". KaaXeM: And here there's nothing on the table and your wife is waiting for you at the goban. Isn't it dreadful? tatsuha: It's a good subject for a horror movie. What about You and Dina? Do you play against each other? When I lived in Korea I used to play for some stakes at least for a Coca Cola can. What are your stakes? Doing dish-washing for example? We play 2-3 times a day. Sometimes we bet a wish but usually we just play for nothing to stay in a good shape. I used to play only online games so I have little experience in real games. So, at first Dina won me in 9 out of 10 games. If we played for wishes then I could have become an eternal slave. We like to watch pro games and solve Go problems. I haven't seen you in pair Go tournaments yet. Did you try to play pair Go? Do you plan to prove your strength in pair tournaments? We only tried to play together - without exchanging the move order. The strength is usually higher then when we play alone. We didn't try to play rengo exactly but I hope we try it soon. Yes, we'll try to take your title in February. Is there any other pair in Russia where both husband and wife are good Go players? I can't remember any of such pairs. There are pairs of Go players but as far as I know there are not any strong ones. It is not the most important thing in a marriage. There are a lot of such pairs in Japan - dozens of pro+pro pairs, including the superstars: Cho U and Kobayashi Izumi, Sugiuchi Masao and Kazuko, Yo Kagen and Chinen Kaori and others. How can you explain this? On one hand, professional players often meet each other at different tournaments, they spend a lot of time together - that's the explanation. On the other hand, people with common interests can build a relationship much easier. If this interest takes all your life it is easier to share it with the one of your strength, with a person who is also constantly practicing in it. Do you plan to teach your children Go? I hope we can involve them in this amazing game that gave us each other and many happy days and years. Dina's father used to give her some money for solving Go problems (100-200 roubles). Once Dina asked him to set her a problem that cost 10000 roubles. She spent 2 hours on it but couldn't solve it. In conclusion, give some good advice for those who play Go but is still single. Do you advice to look for him/her at the Go tournaments? Or on KGS? By the way, one can make a special "Dating room" there. You should not try to search intentionally. You'll understand when the right person appears in your life. The tournaments widen your range of contacts and so increase your chance to find your mate. Take part in Go tournaments more often. I think the Dating room could be popular but it is much harder to have a distant relationship.